Isaiah 40:29-31 He gives power to the weak, and to those who have no might He increases strength. Even the youths shall faint and be weary,And the young men shall utterly fall, But those who wait on the Lord shall renew their strength;They shall mount up with wings like eagles,They shall run and not be weary,They shall walk and not faint. Nobody likes to wait. My local McDonalds has 2 drive-thru lanes now which you would think could cut down on the wait time but NO! You wait twice as long! So now we can double the wait and double the weight at the same time! Waiting is part of the journey. All the heroes of faith did it. Moses waited 40 years. 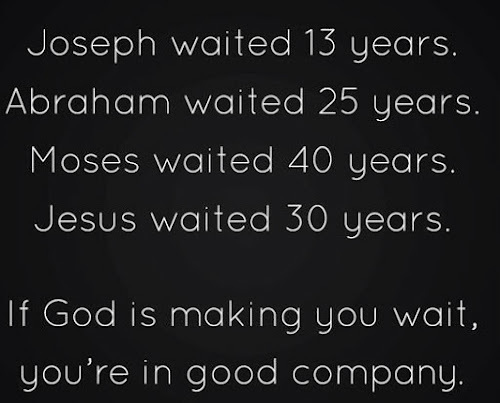 Abraham waited 25 years and Joseph 13. 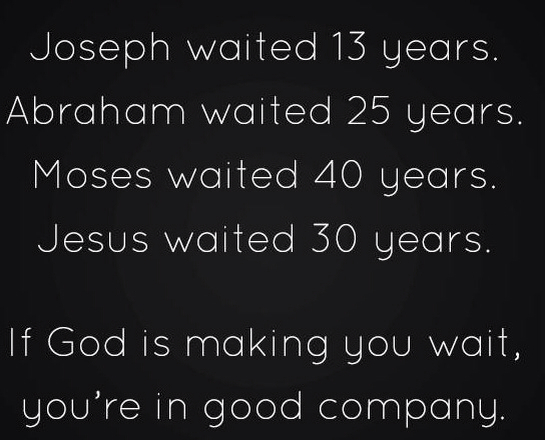 Jesus waited 30 years before his ministry began. So keep your head up, you are in good company! Get ready for your strength to renew and your life to begin soaring. Power comes in the waiting.